Saturday Night Live returns tonight with the first of its last three live shows of the season hosted by “Atlanta” star Donald Glover. You might know Donald Glover as the multiple Emmy Award winning creator, writer and star of the FX dramedy, “Atlanta“. Glover describes the show as “Twin Peaks with rappers”. He uses his real life hometown of Atlanta as the backdrop for his show where he plays Earn Marks who returns home after a failed run as an Ivy League student and is now managing his cousin’s hip hop career who has experienced some burgeoning success. Earn balances that with being a father, dealing with damaged relationships with his family and girlfriend and the seedier side of his hometown and its hip hop scene. While Donald Glover is becoming well known off the success of “Atlanta“, his career is about to go into hyper speed as he becomes famous in a galaxy far, far away. On SNL tonight, Glover will be promoting his new summer action movie, “Solo: A Star Wars Story” where he’ll play a prequel version of the iconic Star Wars character Lando Calrissian, the role originated by Billy Dee Williams. Directed by Academy Award winner Ron Howard, “Solo: A Star Wars Story” is expected to be one of the bigger hits of this summer with Glover getting to play the intergalactic smuggler to becomes best frenemies with the most famous space pirate in movie history, Han Solo. This week, SNL posted a tweet stylized to look like Donald Glover’s Lando Calrissian movie poster which you can see below. If that’s any indication, we should expect a Star Wars sketch in tonight’s show. Donald Glover has all the credentials that SNL executive producer and creator Lorne Michaels looks for when choosing hosts for his award winning variety series each season. Glover is a first time Saturday Night Live host, bringing the total of first-timers during SNL- Season 43 to 11, just over half of the episodes this season. 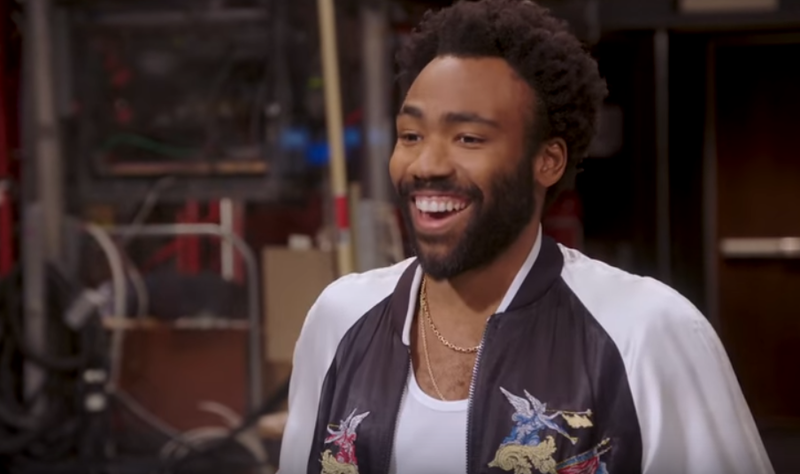 We mentioned Donald Glover’s TV career, which also includes writing for and appearing on the Tina Fey created sitcom, “30 Rock” and co-starring in the NBC hit “Community” and his movie career which also includes, “Spider-Man: Homecoming” and “The Martian“, but he is a triple threat (actually a quadruple threat when you include his stand up comedy success) with an established music career under the name of his alter-ego Childish Gambino. Using his hip hop pseudonym which came from the Wu-Tang Clan’s name generator, rapper Childish Gambino has put out three studio albums which saw major chart success. Gambino’s last album, “Awaken, My Love!” had multiple Grammy nominations and the single “Redbone” from the album brought home the Grammy Award for Best Traditional R&B Performance. And while this is probably considered burying the lead, tonight when Saturday Night Live airs at 11:30pm on NBC, Donald Glover will not only be hosting the show, he’ll also appear as Childish Gambino, the evening’s musical guest. Donald Glover becomes just the 12th person in Saturday Night Live history to both host and serve as musical guest in the same episode. To give you an idea of the company that Donald Glover is in tonight with that dual honor, Justin Timberlake has been host and musical guest on the same night three times, Britney Spears, Jennifer Lopez, Drake and Miley Cyrus have each done it twice and Blake Shelton, Ariana Grande, Bruno Mars, Taylor Swift, Justin Bieber and Lady Gaga have all done it once. Donald Glover stands out even further from this pack by being a stand up comic as well and being more than capable of handling tonight’s Saturday Night Live opening monologue. As for what’s in store for the sketches and Weekend Update portions of the show, let’s face it. In the news, it’s Trump, Trump and more Trump. The President’s non-stop lying about the Stormy Daniels controversy has been making headlines all throughout the time that SNL was off in April and seems to have ramped up even more this week heading back into live shows. Thank you Mr. President. Also, there was the White House Correspondents’ Dinner which some saw as an attack on Trump’s Press Secretary, Sarah “If My Lips Are Moving, I’m Lying” Huckabee-Sanders by the dinner’s host Michelle Wolf. We covered the reaction to Wolf’s act and how fellow comedians had her back extensively on the IBang. This could make it into a sketch tonight with cast member Aidy Bryant bringing her impression of Huckabee-Sanders back to life on SNL and Glover may even address it in his monologue. It’s been a few weeks since we’ve seen Alec Baldwin return as our embattled President, so that’s a real possibility as well. However, the most interesting part of tonight’s new Saturday Night Live, is the return of former New York City Mayor Rudy Giuliani into President Trump’s life. Besides being a sure target for the Weekend Update news team of Colin Jost and Michael Che, we may see another cast member get to join the SNL version of the recurring Trump Administration characters as Mayor Rudy. With Beck Bennett as Veep Mike Pence, Mikey Day and Alex Moffat as Trump sons, Donald Jr and Eric and Kate McKinnon as Attorney General & House Elf Jeff Sessions, we’re curious to see who in the SNL cast will don the make up to become legal adviser and former-Mayor Rudy G. Besides Trump, there’s plenty going on for SNL and Weekend Update to use as material on tonight’s show including the Bill Cosby conviction, the upcoming Royal Wedding and Kanye West’s love affair with the President. Oh wait. That’s just more Trump. In the promos for tonight’s brand new episode of Saturday Night Live, Beck Bennett has a tribute for Donald Glover that turns out to be less than impressive to the host. Fortunately, Chris Redd is there to save the moment. Also, the tradition is for the host and musical guest to do a promo together. Well, in this case, they’re the same person and Donald Glover filmed a very low-key promo by himself that SNL tweeted out which you can also watch below. Saturday Night Live returns live tonight across all American time zones at 11:30pm with host Donald Glover and musical guest Childish Gambino on NBC. Plus, be sure to check our “One Fan’s Journey to Get Standby Tickets for Saturday Night Live” featuring our #1 SNL and Donald Glover fan, Vito Calise from Bennington on SiriusXM’s Raw Dog comedy channel and his crusade to wait in the stand-by line for hours to hopefully see tonight’s Saturday Night Live. The force will be with @donaldglover.